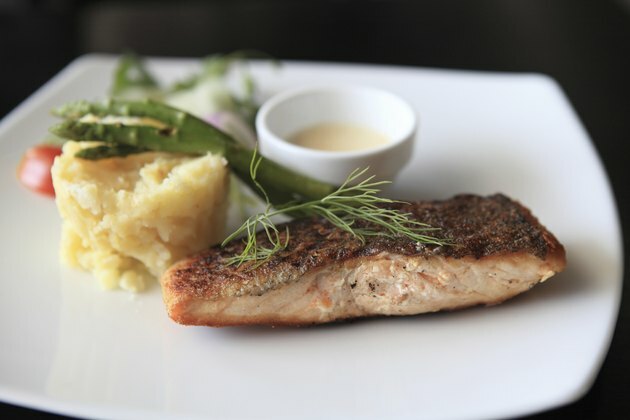 Salmon is one of the healthiest fishes to eat, providing plenty of omega-3s, fatty acids necessary for health according to the American Heart Association. You can cook salmon just before serving or prepare it ahead of time and serve it cold over green salad, or flaked in a salad of whole grains. Two of the simplest ways to cook salmon are baking and grilling. The key is to cook the salmon for about 8 to 10 minutes per inch of thickness. Preheat your oven to 425 degrees Fahrenheit. Allow the salmon to come to room temperature. Cut the salmon into four pieces. Rub a little olive oil on all surfaces of the salmon. Place the salmon pieces skin side down on the baking sheet. Sprinkle with salt and pepper. Bake for 10 minutes and then check for doneness. Insert the tip of a small knife into the thickest part of the fish to see if it is the same color all the way through. If the center is still orange rather than a lighter pink, let it cook for another 2 to 3 minutes. Preheat the grill to medium heat. Allow the salmon to come to room temperature. Prepare the vinaigrette. Combine spices of your choosing with lemon juice and olive oil. Add the herbs, garlic and a pinch of salt. Whisk with a fork until well mixed. Set aside until the fish is done. Brush the fish on all sides with olive oil. Brush the grill with oil. Sprinkle salt on all sides of the fish. Place the salmon skin side down on the grill. After two minutes, rotate the fish 90 degrees to make an attractive cross-hatch pattern on the skin side. After three more minutes, turn the fish over. Cook for three to four minutes, and test for doneness by piercing with the tip of a sharp knife to see if it is the same color all the way through. If your salmon is thicker than an inch, you may have to cook for another two or three minutes. Remove the salmon from the grill and put it on a serving platter. Pour the vinaigrette over the fish and serve. Lay a bed of herbs under your salmon on the baking dish for added flavor. Bake as described above. Serve baked salmon with an herb butter, vinaigrette or mayonnaise. Bake salmon in a pouch of aluminum foil. Brush salmon with olive oil and top chopped herbs. Try brushing grilled salmon with teriyaki sauce while grilling. Serve with additional teriyaki sauce on the side instead of the vinaigrette.